This is the basic unit handbook and SOP for the new recruit. It is designed to assist you in your transformation into a SS-Panzergrenadier. Within these pages are the requirements, rules, regulations, and standard operating procedures regarding everything that every SS-Panzergrenadier must know. We are the premier Waffen-SS unit in the West because at all times we strive to be the best replica of the original. The best in everything, from how we conduct ourselves as Soldaten, to the way we better ourselves as Soldaten! 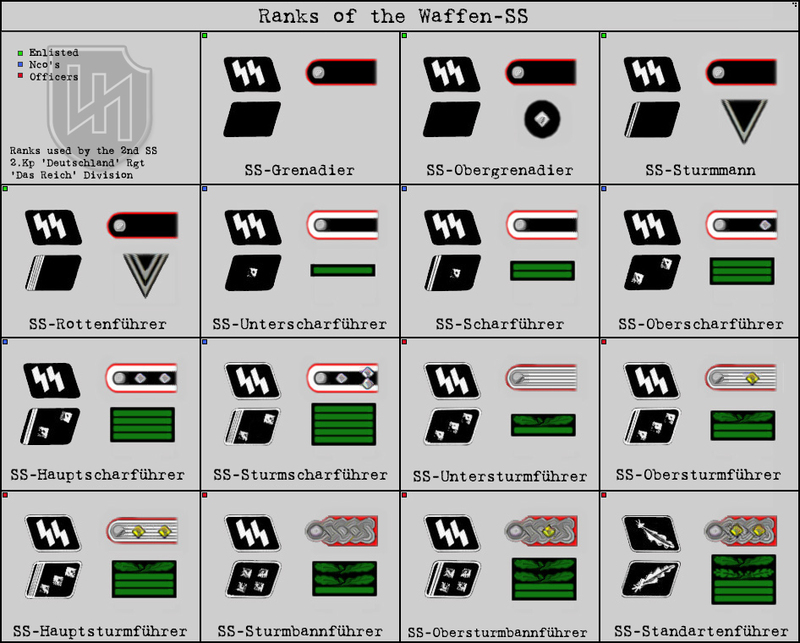 Our entire unit SOPs come directly from either Waffen-SS veterans or original wartime material. Countless ongoing hours of research goes into what makes us the best in the world. Therefore, none of the unit SOPs or guidelines shall at any time be altered unless pre-approved by the unit command. This handbook is going to see many future additions as further studies are made regarding our history. We can all be proud in the fact that everything we do is exactly the same as the original. With every event comes more authenticity, and as we strive together to be the best, comes the most important thing.. Kameradschaft! I wish you the best of luck in your career with 2.Kompanie. Route step, march. Can be used from the halt. Abteilung, Kompanie, Zug, Gruppe, etc., Halt! Move out! or Double time! (HKL) Main line of resistance. Germans did not attack quietly like Americans. It is the duty of every Deutschland Regiment Panzergrenadier to have the most historically accurate, complete, and authentic impression at all times. This will be strictly based off the original issue of items listed as prescribed for the 1942-44 era Waffen SS Panzergrenadier. Any and all variations; which may be in part due to the current supply situation, must first be authorized by the authenticity officers and/or unit command. A reason for variation may be a result of the current supply situation, as was sometimes the case during the period of the war we are replicating. Remember, it is our unit goal to replicate the average issue of the 1944 Deutschland Regiment Panzergrenadier. Studying wartime photos of the actual Deutschland Regiment" will be of great assistance to you. We must accurately replicate our division during its time and not another, especially during a different time of the war. 1.) All items must only be obtained through authorized suppliers. Any and all items obtained through un-authorized suppliers must first be approved by the authenticity officers and unit command prior to purchase. Any existing items may be deemed unauthorized upon inspection and will therefore not be permitted. 2.) The minimum of (1) item be obtained prior and between each event. This may include the upgrade and/or repair of items already obtained. At any time, any item may be deemed un-authorized by the unit command. This may be the direct result of the constant upgrading of reproduction techniques. It is not our mission to fall behind, but rather lead the way as the most authentic and best trained Waffen Kompanie in the world! The following is a brief summary of the weapons used by the Waffen-SS and the 2.SS Panzerdivision. Standard issue battle rifle. Found in a number of configurations and uses, such as for sniping when fitted with an optical scope. Also found fitted with the Schieߢecher (Grenade Launcher). Please note that ONLY German variants with correct assemblies (ie: no foreign country bolts, etc) may be used. Early war, experimental semi-automatic rifles, the (M) designation referring to the Mauser produced design, and the (W) to the Walther produced version. Neither version saw much success during troop trials and were subsequently discontinued, though Walther later moved on to produce the much more successful Gewehr 43. An advancement of the earlier Gewehr 41 model made by Walther, utilizing a more reliable gas system similar to that found in the Russian Tokarev SVT-40 rifles. This fully-automatic sub-machine gun was the mainstay for the German army throughout WWII, though it was primarily issued on a positional basis, such as to GruppenFuhrers (Squadron Leaders), Fallschirmjager (Paratroopers), and Armored Personell. Selective fire rifle firing a shortened intermediate rifle cartridge. Provided the average soldier the fire power of a sub-machine gun, when needed, with the power of a rifle, though at	the sacrifice of the range offered by a full sized rifle cartridge. The primary general-purpose machine gun of the German army during the early stages of the war, until replaced by the more cost and time efficient MG42, though production continued to the end of the war. Truly the first 'general-purpose' machine-gun, capable of being carried by an individual soldier for use as a light machine-gun as well as on tri-pods for use as a heavy	machine-gun. Adopted in 1938 as the standard issue service pistol. The most widely issued pistol in the German army during WWII and, as such, should be the primary pistol for anyone in the unit to be authorized to have one. Adopted by the German military in 1908 and, though replaced by the Walther P.38 in 1938 with production being halted entirely in 1942, continued to be used and issued to the end of WWII in 1945. The following is a brief summary of what is required, regarding items of uniform and equipment. Looking the best is one of the most important reasons why we stand above the rest. We are Panzergrenadiere of the 2.SS-Panzerdivision Das Reich Deutschland Regiment 2. Kompanie! It Is mandatory when ordering your Schiffchen, that it is two sizes larger than your normal head size. This will insure a proper fit. This was the most commonly worn cap throughout the war by the SS. The Panzergrenadier must first obtain a Schiffchen prior to obtaining a Feldmutze. There were far more schiffchens in circulation in the SS than M43 caps. It is preferred to obtain the SS-Model M42 or M43 Feldbluse. These were the most commonly worn uniforms for the time period we portray. Either the M40 or M42 trousers. The shirt can either be the issue grey or the brown pullover style. The brown shirt was officially no longer a uniform item starting in 1943, but was still worn after that date. Any non-issue shirts must be authorized prior to use. All boots must be treated with boot grease so as to give some degree of water protection. All recruits must first obtain the standard issue low boots. If they are your primary pair of boots then they should be blackened. If for field use then it is permissible to keep them brown. Use leather oil and snow-seal on the boots, upper and also soles! This keeps the leather supple and protected against water. Also helps keep the hobnails from falling out. Get these after you have obtained your Schnurschue. Actual field usage of Marschstiefel should be limited as the lowboot was by far the prevailing boot for the time period we portray. These are worn in conjunction with the low boots. It is just as accurate to not wear these. When not worn it was up to the grenadier to either leave his hosen bloused into the Fussbekleidung, or utilize the "sock roll." SS Schloss The Koppel must be worn very tight as to ensure that the wear of additional equipment will not pull the Koppel down. A tighter Koppel will also ensure the sharper appearance of the "D" Regt. Panzergrenadier! K-98 (2 ea.) All K-98 pouches must be in the color of black. G-43 Worn in conjunction with one K-98 Patronentasche. Both leather and canvas types are authorized. MP-40 Only canvas type MP-40 pouches are authorized. All stitching must be in white. MP-44 Only canvas type MP-44 pouches are authorized. All stitching must be in white. Always worn to the rear of the wearers left hip. Everyone was issued a bayonet regardless of weapon. Prefered leather frog. web is acceptable. Only original wartime Brotbeutelriemen are authorized due to differences in manufacture of post war examples. The Brotbeutelriemen is utilized to carry the Brotbeutel when off duty. A very useful combination for the carrying of personal effects, or toiletry items to and from the latrine. Also it is used as a field expedient means of securing foliage to the Stalhelm. One of the most important items during Einsatz. It is recommended that aluminum cups/Trinkbecher be painted in the correct shade of green or black. The synthetic cups can be used in any of the wide array of colors as origianlly made. It is important that you get the .7 liter size as that was the standard issue. The Gasmask can is required and everyone should get a gasmask to go inside. The mask and Can were issued to all Soldaten and accounted for. In the field It was common to use the can for anything but it's intended use. but when off the line gas masks were inspected and you were in trouble if you could not produce a mask during an inspection. Only the Klappspaten (Folding Shovel) is authorized. Always worn on the wearers left with handle pointed away from the leg. Leather are authorized for wear in the Deutschland Regiment. Leather is by far the most common. Only an original wartime or early PW Kochgeschir will be authorized. The Kochgeschir is either secured to the Brotbeutel or to the assault frame/Sturmgepäck when commanded. Make sure that it is painted the correct color! Only worn when going into Einsatz when the Kompanie will not be returning to the present location. This will happen only when commanded by the unit command. Good quality reproductions or originals are preferred! Model M35, M40 or M42. It is preferred that the Model M-42 Stalhelm be acquired as was the majority in the Das Reich-Division. When worn, only the single SS rune decal (right side of Stalhelm) will be used. but actual decals in usage should be minimal as they were no longer applied after Mid 1943. The chin strap/Kinnriemen buckle is worn opposite of the wearer's hand of use. (If you are right handed the buckle should be on your left side). This is to prevent snagging when operating your weapon. Preferred type II The most common Tarnhemd worn by the Das Reich-Division was the planetree pattern . Do not get another pattern. Should be loose enough to allow the wool uniform to be worn underneath. It is recommended that SS sleeve eagle be applied to the left arm. Only the machine embroidered sleeve eagle will be authorized. Read the " How to Fold a Zeltbahn Quarter Guide " This is of utmost necessity when in the field. It's importance is often greatly overlooked until it is needed! You must obtain a Waffen-SS type Zeltbahn in the plane tree pattern. The M-40 Schiffchen must be obtained prior to a Tarnmutze. Due to rarity, no insignia of any type will be authorized for wear on the Tarnmutze. Acceptable patterns are Grey, Fall Oak, Fall Blurred edge. Parkas are currently not a usable item unless given explicit permission by the Oberst청fuhrer. An issued and inspected item, all Panzergrenadier must strive to own a Mantel. A very important item. All Mantels must have a machine woven SS EM sleeve eagle applied to the left arm. All Wolldecken must be of the gray type with or with out markings. Captured stocks may only be utilized in the field and after obtaining unit command approval. This book is your ID and the record of your enlistment that you are to carry with you at all times unless you are directed to otherwise by an officer. Any rank or decorations must be substantiated by the info in the Soldbuch, should any Feldjagers take an interest in you. Only the Issue handkerchiefs are to be used. to be carried in the bandage pouch in your feldbluse (You were required to have the above items prior to being allowed off post). A very important item when washing up after Einsatz! Also important for keeping your billets/Unterkunfts AO uniform with the Kompanie, the Handtuch is secured at the head of the bunk over the frame. no non period lighters are to be used. No filtered cigarettes are to be used. Period pipes and cigars are highly encouraged. Germans liked to smoke. Original or good reproduction unterhosen are recommended and will make a good touch to your impression. This will make Mittagessen much more bearable. Razor,soap, tooth brush, hair grease and the like. To be carried in the little inside pouch in your feldbluse. All Handschue must be of the thick wool type in the color gray. The white size rings must be worn on the inside. All issue socks were gray wool with white rings denoting size. Any and all Socken sent from home as replacement must first be approved by unit command and only after the issue Socken has been obtained. It is mandatory that a minimum of (2) pair be obtained. Poles pegs ropes and bag. 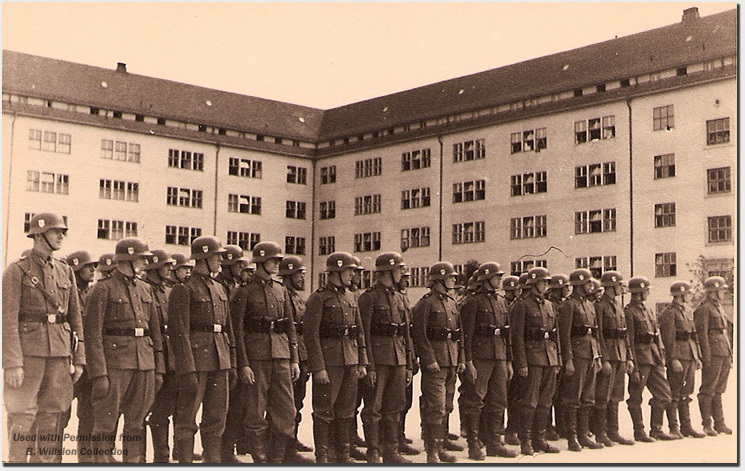 The German Army would place their wool blankets and pillows in a blue/white checkered cotton covers. Their primary use are for barrack events. If you have any questions regarding any item you are about to purchase, as to its quality, authenticity, or overall uesefullness to yourself and the unit, don't hesitate to speak with the unit commander. If you show up for Einsatz with an un-approved item, or an item that was not used at the time which we are portraying, you WILL NOT be able to use that item at the event. Don't waste your hard earned money on things that are un-approved or un-authentic!